Woodside’s Preliminary Challenge is a great measure of up-and-coming talent on the West Coast. For the last decade both professionals and amateurs have lined up to test their skills, and with $15,000 on the line it always produces a fiercely competitive environment. 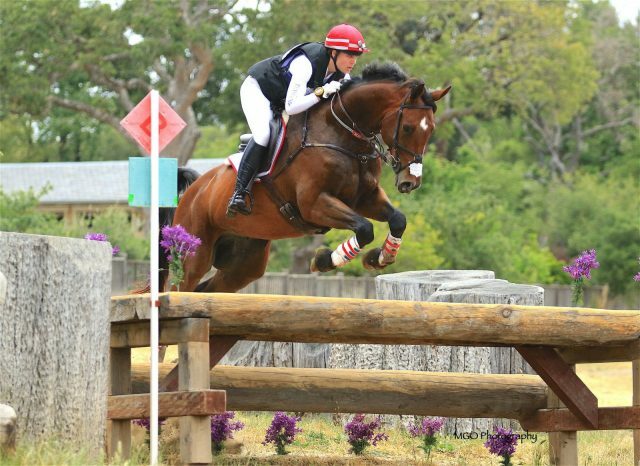 Saturday began on the cross country where Preliminary Challenge debutants Jordan Linstedt and Krista Stevenson edged ahead of the rest to lead the horse and rider divisions, respectively. Then it all came down to the final show jumping phase. Flanked by a bustling patrons’ tent, Woodside’s Grand Prix arena was electric as they jumped in reverse order of standing. Both leaders kept a lid on it, jumping clear for the win. Krista Stevenson and Caison. Photo by Marcus Greene Outdoor Photography. Krista earned one of only four double clear show jumping rounds with her and Larry Stevenson’s Caison to finish on her dressage score (30.1). 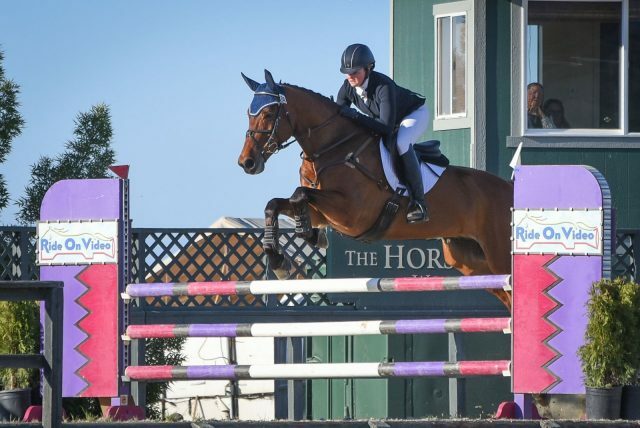 She and the 10-year-old Hanoverian have had a rocky start to the season, but overcame all odds this weekend for a top finish. “Just going through cross country was such a big deal with this horse. We struggled a little bit this season, and that clear round was really emotional for me. He was just so good,” she smiled. Jordan Linstedt and Staccato. Photo by Marcus Green Outdoor Photography. While Jordan has seen plenty of competition from coast to coast, she wasn’t sure what to expect from her first Preliminary Challenge with Janine Jaro’s Staccato. “He was fantastic. He jumped out of his skin the whole way around. It’s nerve wracking going in there because you never know—you could get unlucky and have a silly rail come down, but he jumped his heart out all the way around. And after jumping cross country this morning, you’re not ever quite sure what you’re going to have either, but he felt like a million bucks. Plenty energy and a super jump from beginning to end,” Jordan said. She and the 9-year-old Hanoverian were tied for the dressage lead, and continued through the jumping phases with no penalties added, solidifying their win on a score of 28.8. 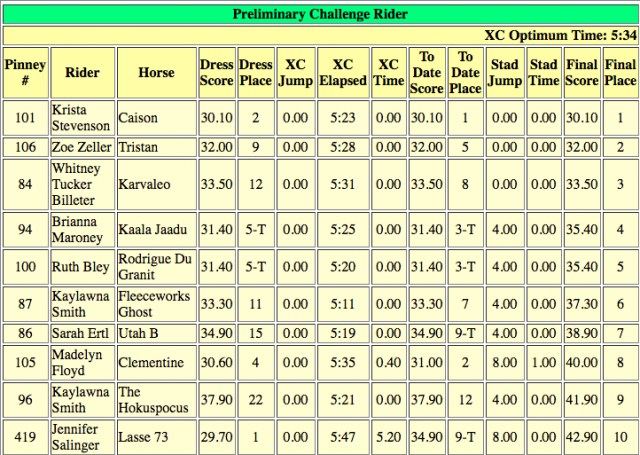 Now they forge ahead toward the CCI* at Rebecca Farm, and a move up to Intermediate is on the horizon in the fall. 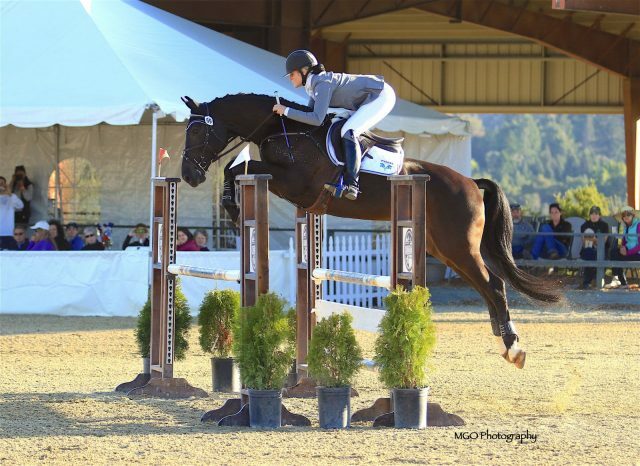 In the rider division, Zoe Zeller and her own Tristan steadily climbed the rankings throughout the weekend, moving from ninth to fifth before finally landing in second, adding nothing to their dressage score across the jumping phases. The 12-year-old Holsteiner concludes the weekend on a score of 32. Whitney Tucker Billeter and Karvaleo. Photo by Shelby Allen. Whitney Tucker Billeter, who began the competition in 12th place, also found herself climbing with her own Karvaleo. They finished with a score of 33.5 with no additional jumping penalties added. Their third place result was an overwhelming success for the 7-year-old Irish Sport Horse who started his evening career with Tucker Billeter only last year. 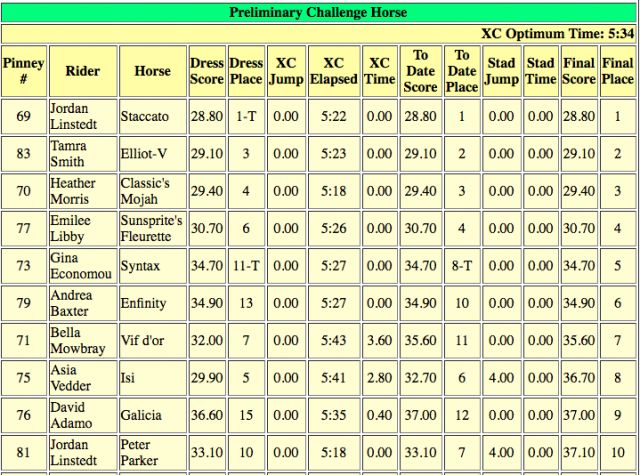 Following Jordan in the horse division is Tamie Smith with Luisa Southworth’s Elliot-V into second place. She and the 9-year-old Dutch Warmblood delivered a double clear effort in the final phase to finish on 29.1 points. Smith is followed in third by close friend Heather Morris, who finished on on 29.4 points with Classic’s Mojah, a 9-year-old Oldenburg owned by Megan N. Sykes.